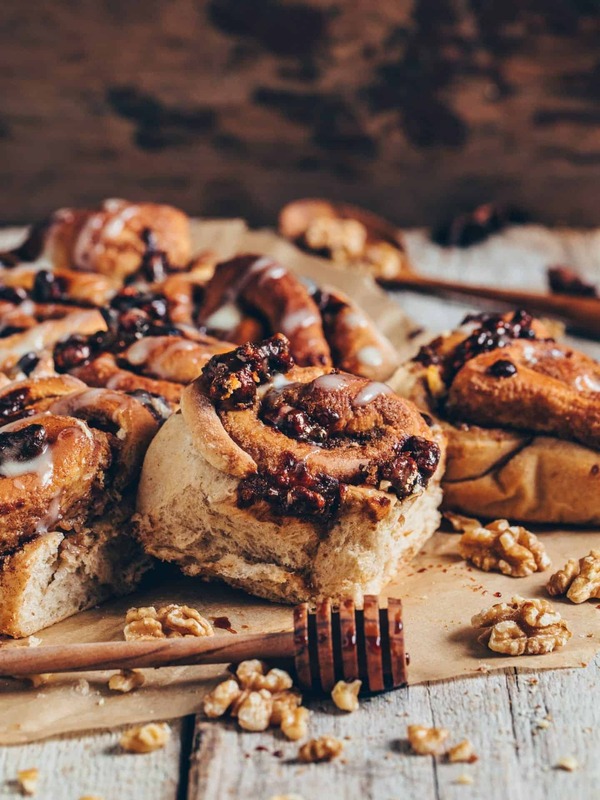 Best easy vegan cinnamon rolls with cashew frosting. They’re soft, fluffy, and delicious. Furthermore, they’re healthier than the average cinnamon buns are because they contain no white sugar, no eggs and are dairy-free! Ideal for a snack, breakfast or dessert. I don‘t know about you, but I need to make cinnamon rolls at least once a year. 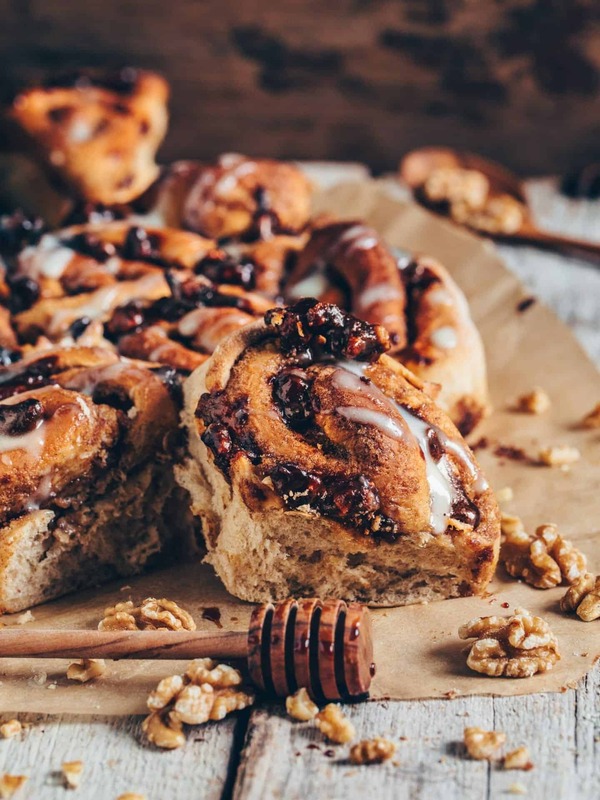 Preferably a homemade and healthier version of cinnamon rolls, which by the way are also incredibly delicious! Making it possible to enjoy more of them without a guilty conscience, hihi. For some reason I usually make them on St. Nicholas’s Day, so I thought that it would be a good idea to share the recipe with you today! 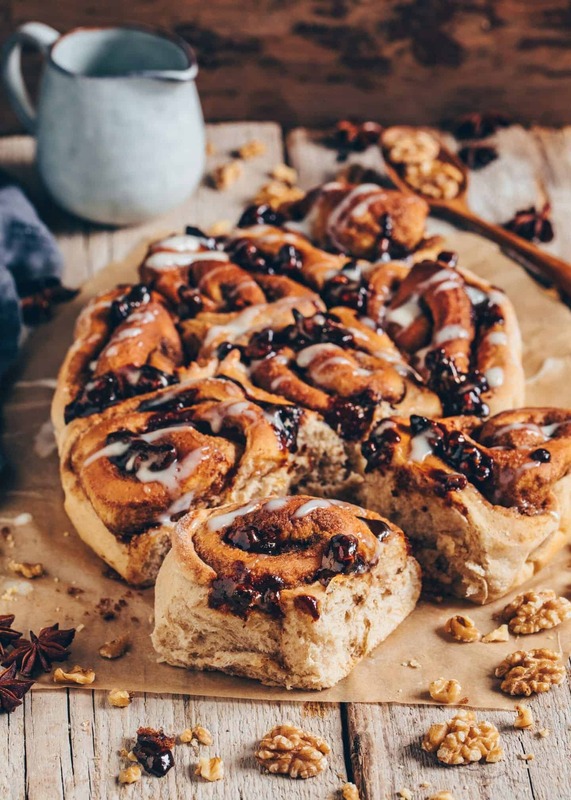 Of course, you can make these delicious easy vegan cinnamon rolls any time, but maybe you also want to bake them on this holiday too. 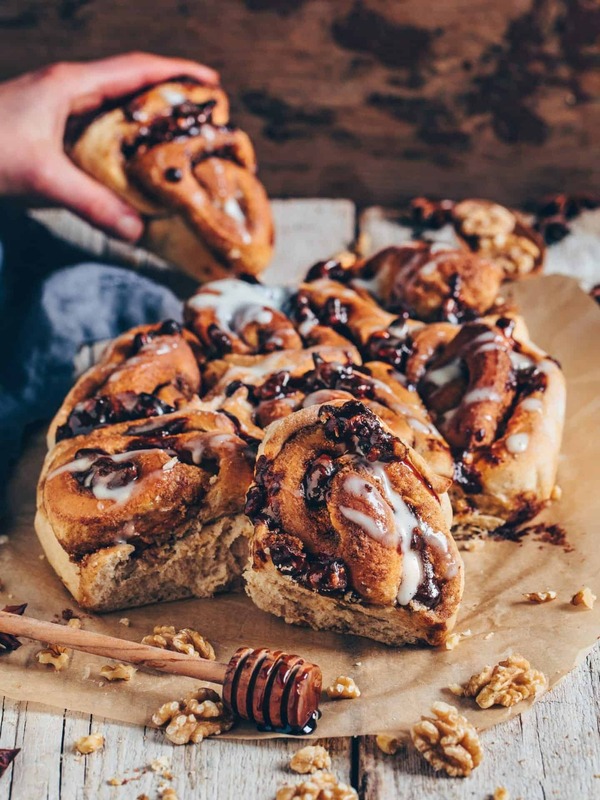 Obviously, vegan cinnamon buns are the perfect treat for Christmas time, and they come together super fast. I imagine that like me, you will probably have the required few simple ingredients on hand. 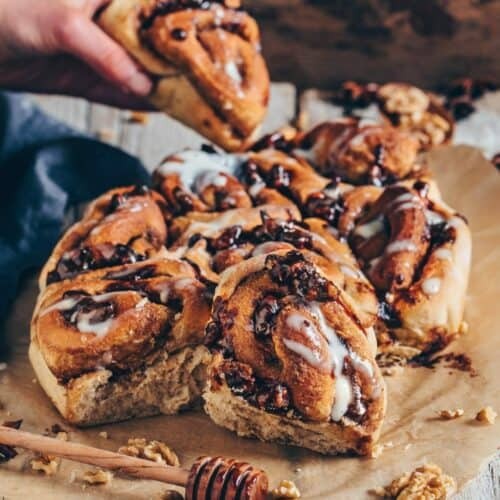 The great thing about this recipe is that these easy vegan cinnamon rolls are much healthier than the ones you’re probably familiar with. Instead of conventional white sugar, I used coconut blossom sugar. The sugar extracted from coconut blossom has a low glycemic index. Which means that your blood sugar level rises slowly, making you feel satisfied longer. Maybe you know the problem with food cravings, which are caused by blood sugar fluctuations after consuming treats that are loaded with white sugar. If so, you know what I’m talking about. 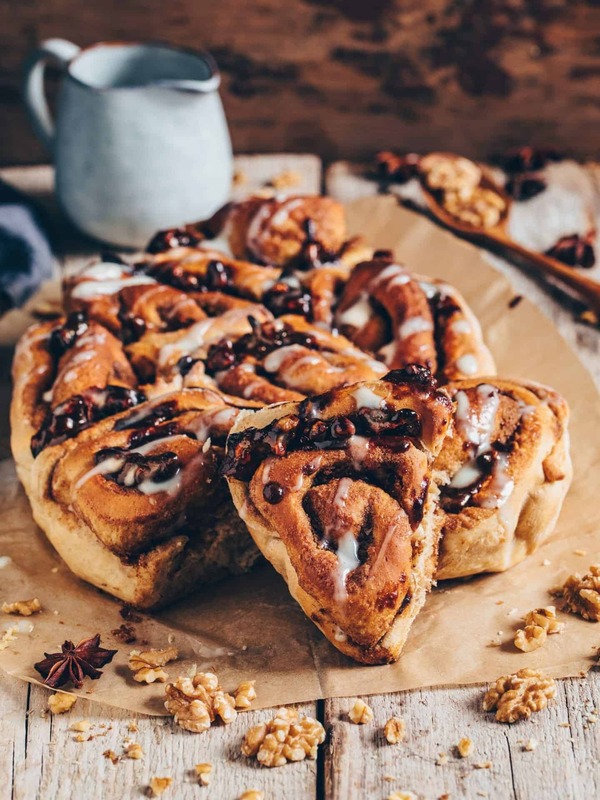 Incidentally, cinnamon rolls come from Sweden and are therefore also called “Swedish cinnamon rolls” or “Swedish cinnamon buns” or in the Swedish language “Kanelbullar”. But they’re also well known in America. Anyways, they taste incredibly delicious because they are so soft, fluffy, gooey and have a flavorful cinnamon filling. That‘s why it‘s definitely worth it to make the yeast dough because the secret is in the chilling time. Besides the waiting time, they‘re made super fast and easy! Honestly, I’m personally not one of the most patient people, but for these cinnamon buns, I‘ll take the time. And trust me, once you’ve made yeast dough for the first time, you’ll be surprised how easy the preparation is! 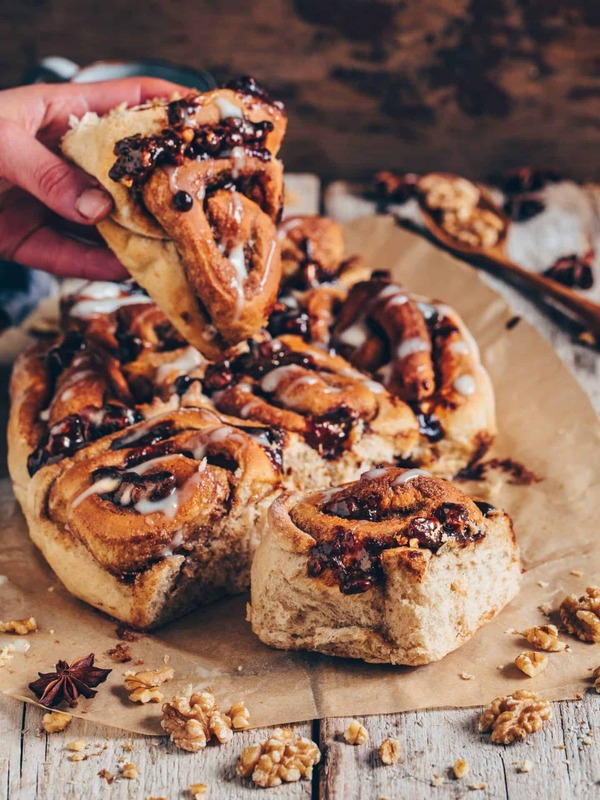 Similarly, the filling for these easy vegan cinnamon rolls is also mixed together quite easy and fast. It‘s only made of vegan butter, coconut sugar, coconut syrup, and cinnamon. I also like to add some chopped walnuts and raisins, but of course, that’s just an option. 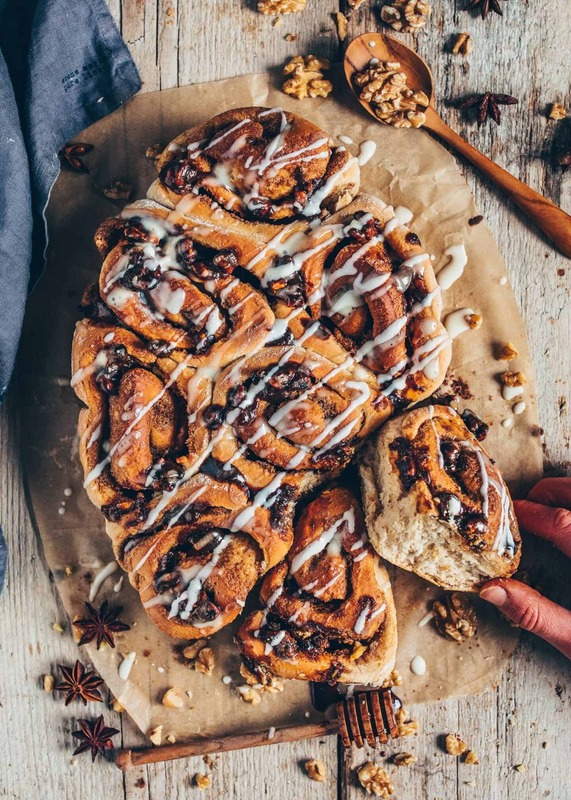 Despite their filling, cinnamon buns are generally not that sweet, but that’s a good thing because then you can smother them in a delicious frosting. I made mine with cashews and coconut, and let me tell you, it‘s truly so delicious! I think it tastes so much better than the simple classic frosting, which is made of only powdered sugar, water, and a little lemon juice. 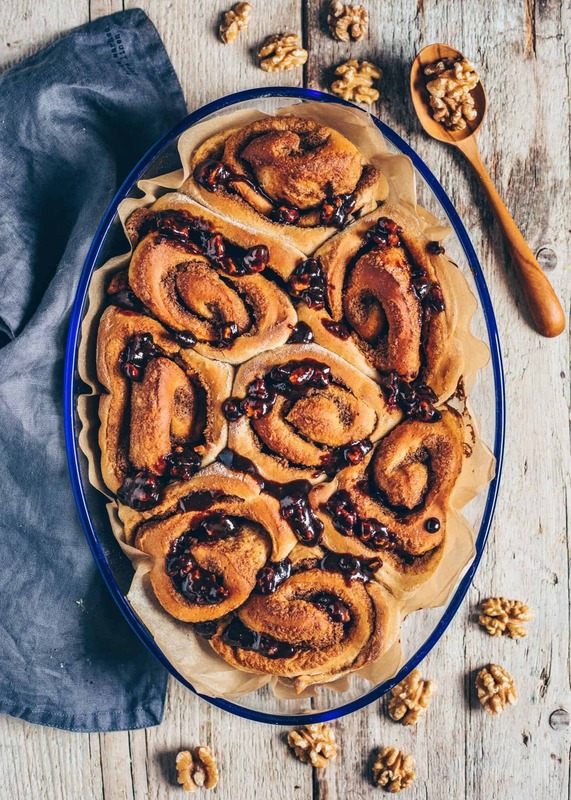 As I mentioned before, you can use any toppings you like for your easy vegan cinnamon rolls, like nuts or raisins for example. 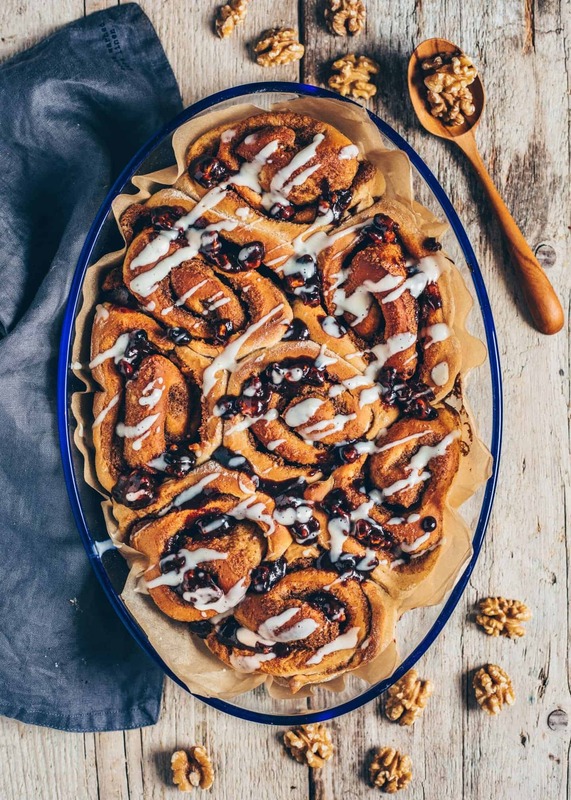 However, you can also enjoy the cinnamon rolls plain just like that, without any toppings, with nothing more than the cashew coconut frosting or any other spread of your choosing. If I serve them for dessert on cozy tea or coffee afternoons, I’d rather them be a little sweeter. But for breakfast, on the other hand, I like them more when they‘re not so sweet. 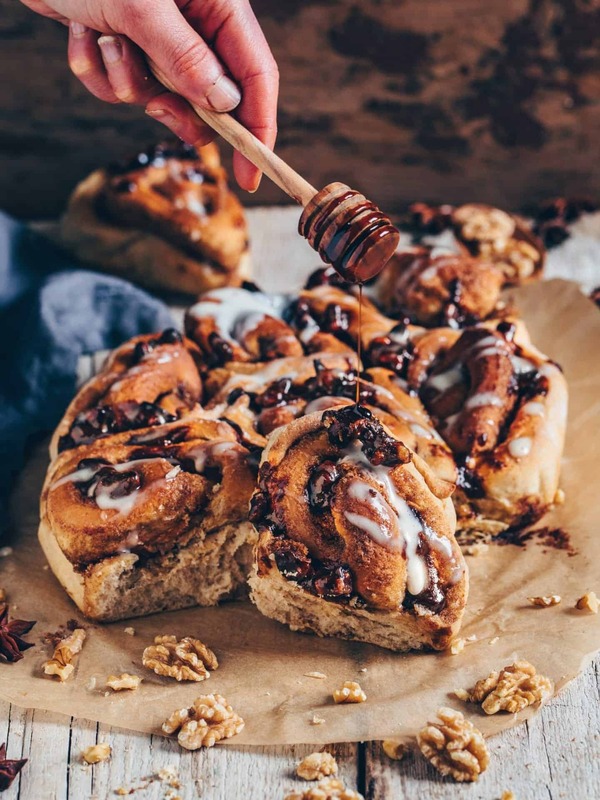 Best easy vegan cinnamon rolls with cashew frosting. They’re soft, fluffy, delicious and healthier because they contain no white sugar, no eggs and are dairy-free! Ideal for a snack, breakfast or dessert. Crumble the yeast and dissolve with 1 tablespoon of sugar in the lukewarm milk (approx. 95°F/ 35°C). Melt the coconut oil and add to the milk mixture. Add the sugar, cinnamon, cardamom and salt. Then add the flour and knead the dough using your hands or in a food processor, until smooth and stretchy, for about 10 minutes. Then put in a large bowl, cover with a damp kitchen towel and let chill on a warm place for 40 minutes. In the meantime, melt the vegan butter over low heat. Add the coconut sugar, coconut syrup and cinnamon and stir to a syrupy, viscous mixture. Stir in chopped nuts and raisins if desired. Once the dough volume has doubled, it can be rolled out on a well-floured working surface to a large rectangle, about 1 cm thick. Then spread the filling evenly over the dough. Carefully, roll up the dough from the long side, then cut into even sized pieces (approx. 1.4 inch /3.5 cm thick). Place them in a greased or parchment paper lined baking dish, leaving enough space between each cinnamon roll, as they will rise a lot. Let chill for further 30-45 minutes. Preheat the oven to 356°F (180°C) top and bottom heat. Optionally brush the cinnamon rolls with a little melted vegan butter before baking and bake for about 20 minutes. Mix all ingredients for the frosting in a high-speed blender, until you get a smooth and creamy sauce. Add a little more plantbased milk to thin, if needed. (If you don‘t have a blender, you can simply use cashew butter. Just mix the ingredients together using a whisk). 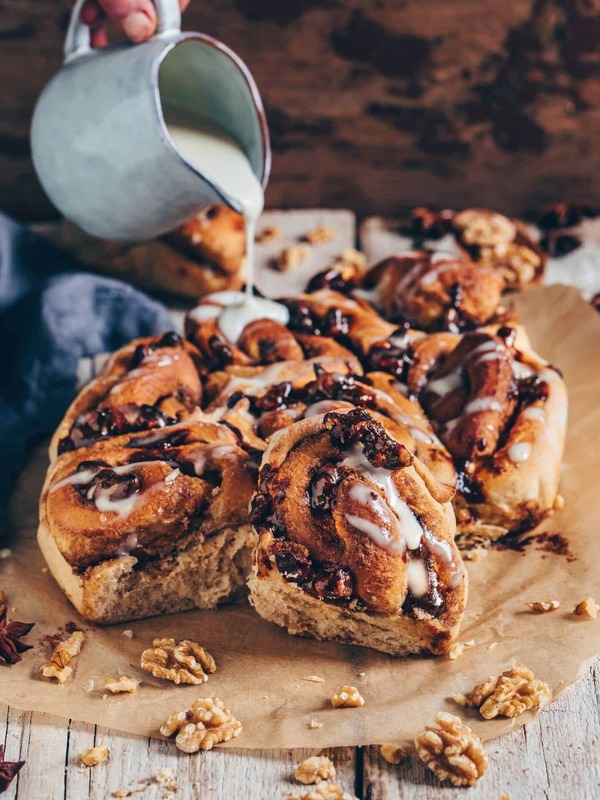 Allow the cinnamon buns to cool slightly after baking and pour over the frosting. You can use spelt flour or a gluten-free flour blend for this recipe, you'll get the fluffiest result by using regular plain all purpose flour. If you don‘t want to bake all of the cinnamon rolls at the same time, you can freeze them individually after walking. Simply lay the rolls next to each other with a little distance between on a plate and place it in the freezer for about 2-3 hours. After pre-freezing you can put them in a sealed container or freezer bag, because so they do not stick together anymore. The cinnamon rolls taste best when they‘re freshly baked, so I recommend eating them within 2 days. But you can also freeze baked leftovers. When serving, simply thaw and rebake briefly in the oven. Thank you, my dear Klara! I’ve maid it today and I can tell that it deserves the 5 star rating. When will you post the Vegan Cheesecake Crumble with Cranberry recipe? We are all waiting for it and I wanna make it for Christmas. I’m so happy that you like this recipe so much! I will share the recipe for the cranberry cheesecake next Sunday! Looks amazing, Bianca! 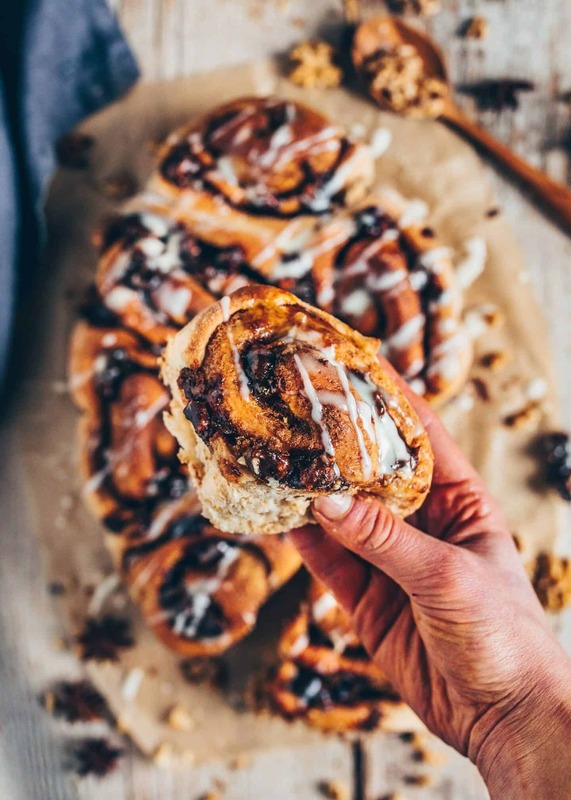 I adore cinnamon rolls and I want to stuff my face with yours, haha.